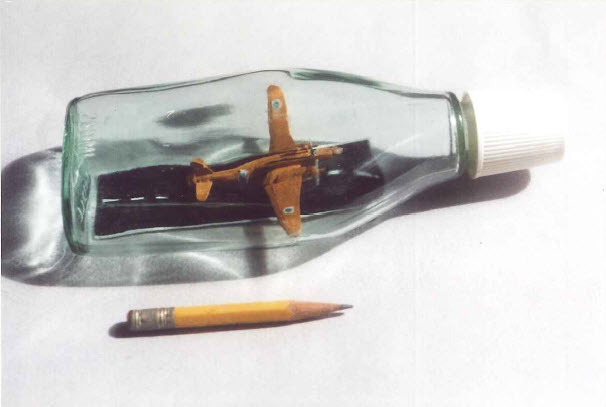 Folk Art In Bottles - Bernie's Wellington Bomber - by Charles Hand, Jr.
Bernie's Wellington Bomber - by Charles Hand, Jr.
A packet from the UK arrived one day. Inside was a letter from Gwen and Bernie Palmer in faultless penmanship (which he thought arthritis in his hands affected). He included the March 2012 issue of a magazine, Scottish Memories, as it contained interesting articles about start of the U.S. base in Holy Loch in 1961 – which I visited many times, long ago. 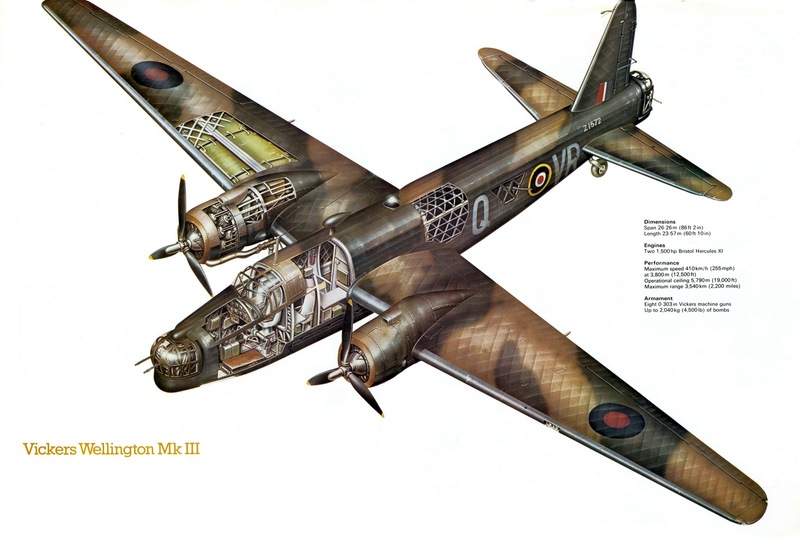 Bernie mention another article in the magazine about salvaging a Vickers Wellington bomber from Loch Ness where it ditched in 1940. It is now in an aircraft Museum. Bernie piloted one in the 1950’s. I mentioned the latter to a friend who promptly supplied me with four useful pages from the Wikipedia Encyclopedia. 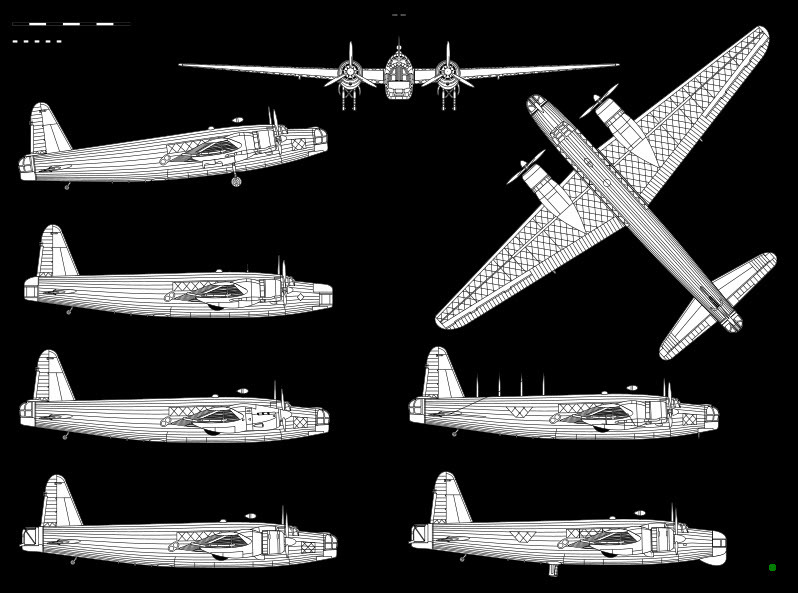 One page had 1:192 plan, profile and front views of Wellington bombers. I made 50% copies (1:384), cut one out and tried that in a 200 mL Bicardi rum bottle with a neck inside dimension of 5/8 inch. 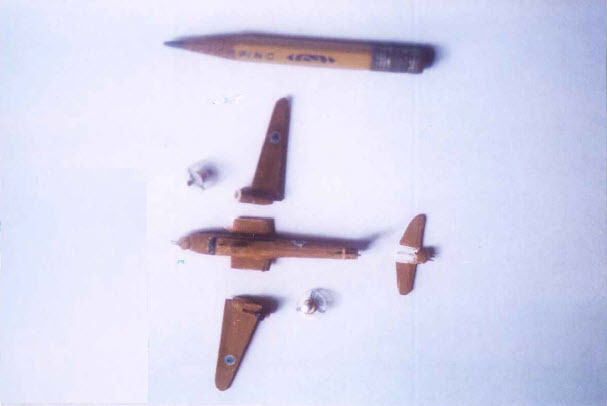 Many materials for the model were styrene sheet (laminated for the wings), rods and tubing (nested for the fuselage) joined with the Testor’s plastic cement from a tube. That seems to make the models sturdy to withstand bottling and shipping. Black paintbrush bristles form the nose and tail gun and blonde paintbrush bristles the topside antenna wires. 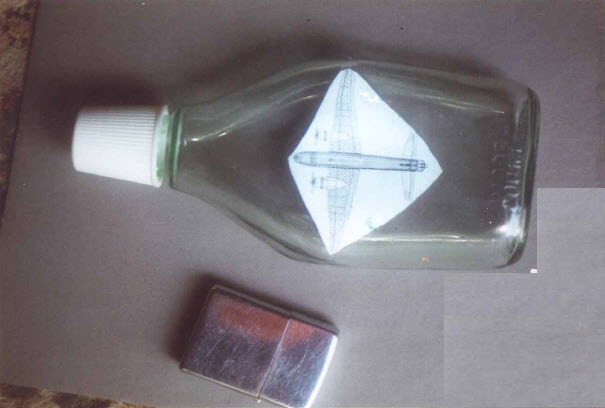 The Testor’s cement was also used to assemble components inside the bottle. Thankfully it could be scraped off the bottle when dry. That required touching up the acrylic paint to avoid glossy areas. Photos indicate the planes were dark brown but I used a lighter brown to contrast with the black tarmac runway. 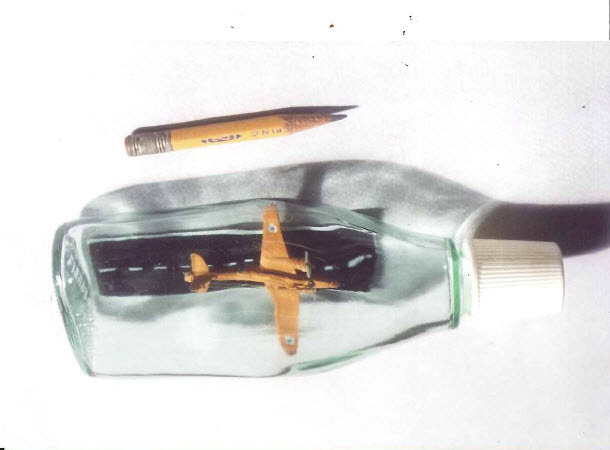 A label was glued to the underside of the bottle. 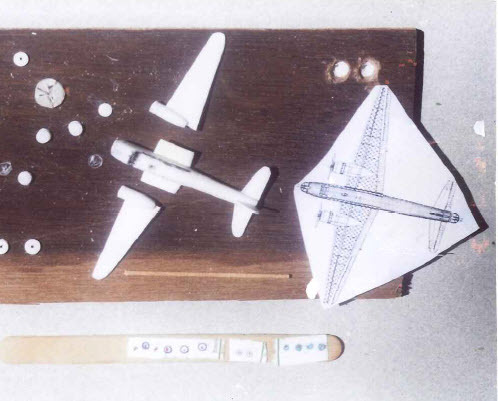 A temporary wood block, 3/16 inch square was used to raise the fuselage while attaching each outer wing. 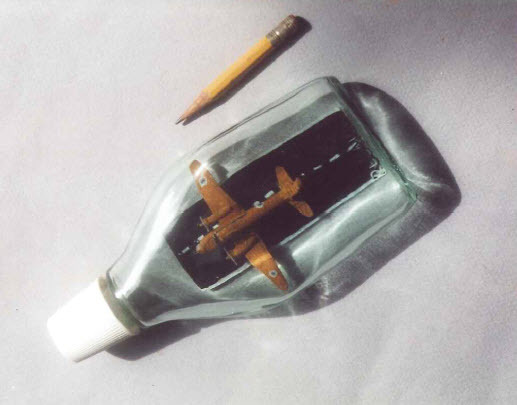 Tips of each wing were adhered to the bottle sides to suspend the plane just above the runway, using Elmer’s white PVA glue. 1. 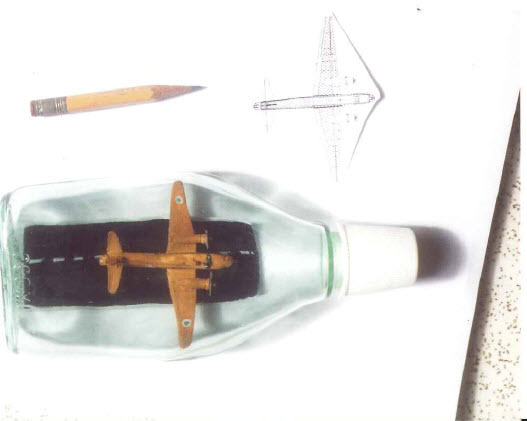 Using a scale paper template to check size for fit inside a 200 ml Bicardi rum bottle with a neck inside diameter of 5/8 inches ( 1.68 cm). 2. Styrene components and process. Plyboard has indentations (lower left) in which hemispherical pieces were formed. Popsicle stick at top has sample insignias on cigarette paper glued to it. Draughting tape is yet to be removed from clear styrene propeller disks. 3. Segments to be bottled. 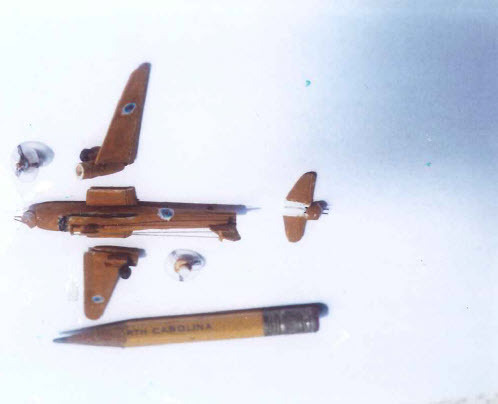 Left (port) wing is topside down to show landing gear.